Black-necked crane is first class national protected animal and the only crane in the world that grows and breeds on the plateau. 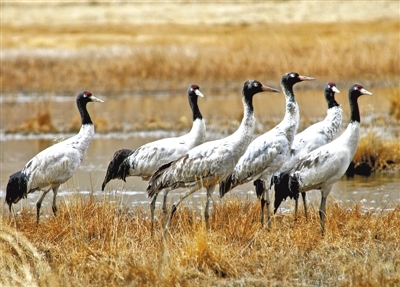 Lhunzhub County of Lhasa City is a famous natural reserve for black-necked cranes. Every year starting in mid-October, a large number of black-necked cranes will migrate here to overwinter. In recent years, Lhunzhub County has effectively strengthened the protection of wild animals, put an end to the indiscriminate killing and overfishing, and endeavored to protect the habitat of wild animals from destruction. The number of wild animals has continued to increase.